Please help celebrate the 51st annual IPA Festival and Convention, held at the Millennium Hotel in Buffalo, NY. The Festival will kick off with a welcome party on Friday, the Polka Music Hall of Fame and Music Awards Banquet and Pool Party on Saturday and a Polka Mass and annual election of officers and convention meeting on Sunday. 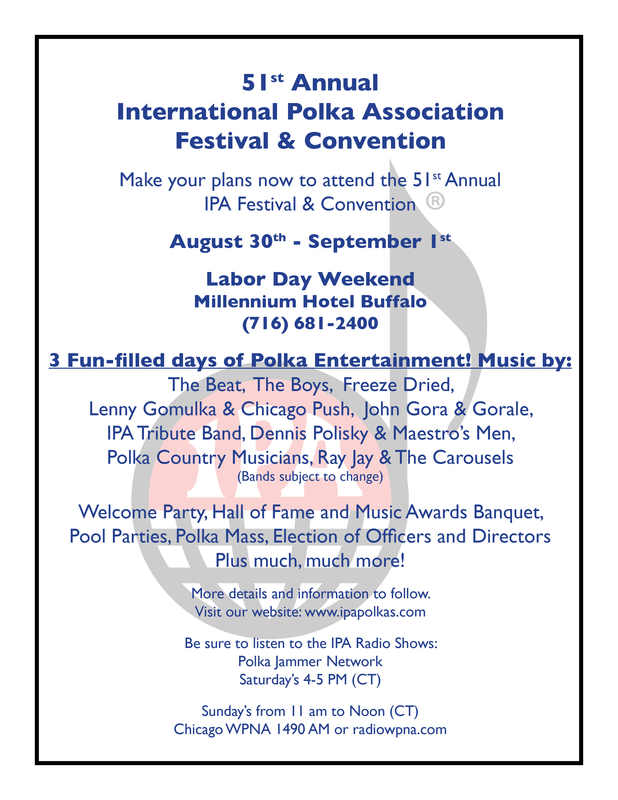 Room reservations can be made by calling the Millennium Hotel at (716) 681-2400 and mention the IPA Polka Festival to receive the discounted room rate. Good Ole Fashion “Unplugged” Jam Session for all! Bring your Instruments!